Cecil B. DeMille’s 1956 masterpiece, THE TEN COMMANDMENTS has been restored and put on Blu-Ray. It tells the story of Moses and the deliverance of the Hebrews from the slavery of the Egyptians. 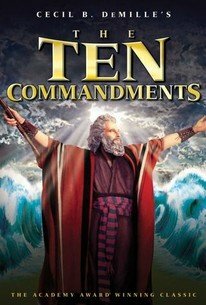 THE TEN COMMANDMENTS is clearly a magnificent achievement in the history of film, with superb performances by Charlton Heston and Yul Brynner, wonderful direction by DeMille, and a theological, biblical power.